So I just spent the past five months majorly re-writing my manuscript, per the amazingly comprehensive feedback from my awesome agent. I re-wrote the entire first 2/3s of it. After it’s been re-written so many times already. I’ve lost count of how many different chapter ones I’ve had. It was grueling, but I cannot find the appropriate words to express how proud I am of the outcome…which is kind of bad, seeing as I’m a writer. I think (hope!) it’s finally there. Anyway, I sent my agent the shiny, vastly-improved new manuscript four days ago! And now I’ll be waiting awhile for feedback. I feel like there’s this gaping hole in my life. Like, what do I do with myself now that I’m not brainstorming, writing, enhancing setting, re-reading, and editing Hooligans? Oh, and slashing word count. And…I miss my characters. Already. I love them all for different reasons. I’ve spent so, so much time with these characters over the past two years. To really capture them, I’ve had to live inside their heads. Experience their past, present, and futures through their eyes. Imagine their reactions to things as massive as losing a parent to as mundane as hearing certain songs. Not going to lie, it’s made worse by the fact that one of the MCs is my most favorite character I’ve ever written of all time. And for this particular story, I don’t think a sequel’s appropriate. Missing imaginary people…sounds a bit strange. Not normal. But really it’s because our writerly brains operate on a different plane of existence, right? *sigh* Guess I’ll get to work on all the critiquing I’ve fallen behind on. Oh, and that other MS I’ve got going. 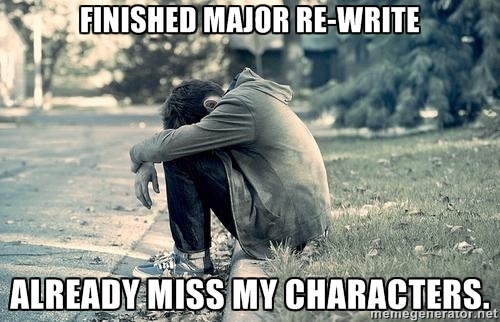 Writer friends, do you find yourself missing your characters when you set a manuscript aside? When I first set a manuscript aside after a long and arduous rewrite, I actually never want to look at it again. Then, after a couple weeks, I start to miss it and want to go back, though I know taking a break from it while waiting for feedback allows me fresh eyes to view it again later. Sometimes I want to chuck it out the window, but, of course, I never do, and I fall in love with the story and the characters all over again. Yes. This. All of this. So I don’t miss the MS. God no. Like I never want to open the file again. At least for a few weeks 😛 But I miss my characters. Just not the plot, I think. That’s what it is! It’s the plot I’m sick of. And line editing… haha. Gah! Line editing can kiss my grits. (I’m not from the South by the way. I just like the phrase). 🙂 And while I do miss my characters, some of them I could just smack upside the head for what they do and how they get into trouble and such. So while I write curious, courageous characters, I actually adore the quiet ones who play it safe. Because that’s what I would do. Haha! Yes, I put myself into some of my characters, but I’m naturally an introvert at heart and NOT a risk-taker, so even though my characters have to take risks to further the story, it always drives me insane!!! I’m actually writing a new story in the same universe as the trilogy I’m about to (finally) release upon the world. It takes place seventy years later, and though I tried not to bring these characters back, they snuck back of their own volition. It’s actually kind of fun writing a story where I can have the new characters suffer the “why can’t you be more like [old character]?” as a legit subplot! Haha love it! And I bet readers will love it, too. Seeing beloved former characters all grown and elderly, interacting with the new ones. Sounds like your universe leaves you lots of room to play, which is awesome! Great idea for a post! I spend too much time with imaginary folk! As a writer I know the feeling, which is why I took my lead characters from my first novel and put them in another story, and why they are now in a work in progress third story. I love these two. Best of luck to you and your characters.